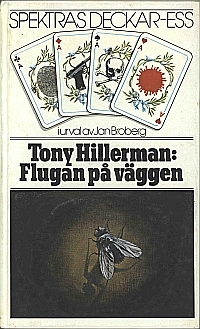 This is the first Swedish edition of The Fly on the Wall. Tony Hillerman's original text was translated from English to Swedish by Lars Ekegre. Format: Hardcover, 12.5 x 20 cm. Binding: White laminated hardboard with full color illustration on front, and photograph of Tony Hillerman and brief biographical sketch on back.